Dylan Fernandes at Vineyard Haven harbor. After a year on the job, State Representative Dylan Fernandes is bringing home the bacon like a seasoned pro. On a warm and bright Sunday in September, after many days of rain, about thirty people piled into a meeting room at the West Tisbury library to raise questions and concerns with State Senator Julian Cyr and State Representative Dylan Fernandes. A few hours earlier, over lunch at Waterside Market in Vineyard Haven, Fernandes and Cyr had wondered aloud if people would be inclined to show up given the beautiful weather and a coinciding Patriots game. They needn’t have worried: they were talking about a chance to pipe up on the issues in the off-season on Martha’s Vineyard. In West Tisbury no less. Chalk it up to the fact that both men are in their first terms representing the Island and both are from the Cape, not that there’s anything wrong with that. They’ll learn: turnout was good and the discourse was steady. Fernandes knows that his age draws attention, but said he wants to be known in spite of, not because of it. His website boasts a prominent quote from his Cape Cod Times endorsement: “Voters would be hard-pressed to guess Dylan Fernandes’ age. The Democrat running for the Falmouth and Islands House seat is confident and well-informed about the issues facing the district.” If he’s young for the job, he seems to want to say, it’s only because he got an early start. The vote on the millionaire’s tax most likely did not come as a surprise to Fernandes’s most important political mentors. His interest in issues may have come from his upbringing – his other passion is the environment – but his political aspiration was sparked after reading The Two Income Trap, which was co-written by Elizabeth Warren. He was in college at the time. “I thought to myself, ‘This woman gets it, and I have to do everything I can to be a part of it,’” he recalled. So he took a semester off to campaign for Warren in her run for United States Senate in 2012. 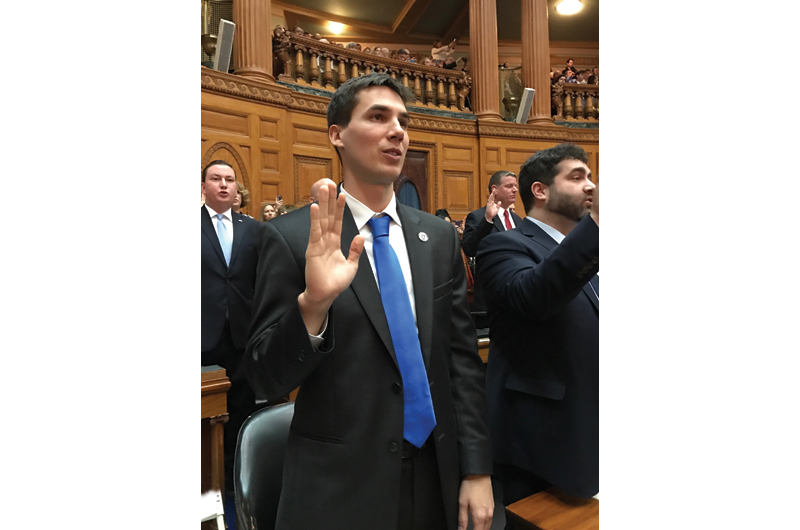 Fernandes was sworn in as a Massachusetts state representative on January 4, 2017. Being a part of Warren’s eventual win was monumental for Fernandes, who admits to being a workaholic but concedes that it’s not always a good thing. For someone who wants to put eighty to ninety hours a week and all of his heart and soul into a project, however, the momentum of campaigning proved addictively rewarding. “You see tangible results at the end of every day,” he said. Perhaps because of his connections to top state Democrats such as Warren and Healey, Fernandes did remarkably well in the early competition for committee assignments. Every freshman representative is assigned to serve on four committees and asked to rank their top three choices. Going in, they know that they might not get those top choices. Fernandes was the only freshman representative to get each of the committees he requested: the Committee on Environment, Natural Resources, and Agriculture; Mental Health, Substance Use, and Recovery; Municipalities and Regional Government; and Redistricting. These reflect the priorities he emphasized throughout his campaign: the environment, affordable housing, and the opioid crisis. He’s also done well in the competition for state money, which is a big part of a representative’s job, particularly given that Democrats control 126 of the 160 seats in the lower House, so the battles are not generally over great ideological divides. “As for metrics of success, Dylan got the most money from the budget of any freshman representative,” said Senator Cyr. The money includes $175,000 for shellfish propagation. He also secured $100,000 for transportation services off-Island for people in need and $25,000 for substance misuse and mental health treatment on Nantucket. In November, Fernandes became the first of his freshman class of representatives to get a major piece of legislation he sponsored through the House: a bill affirming the state’s committment to the Paris Climate Agreement. 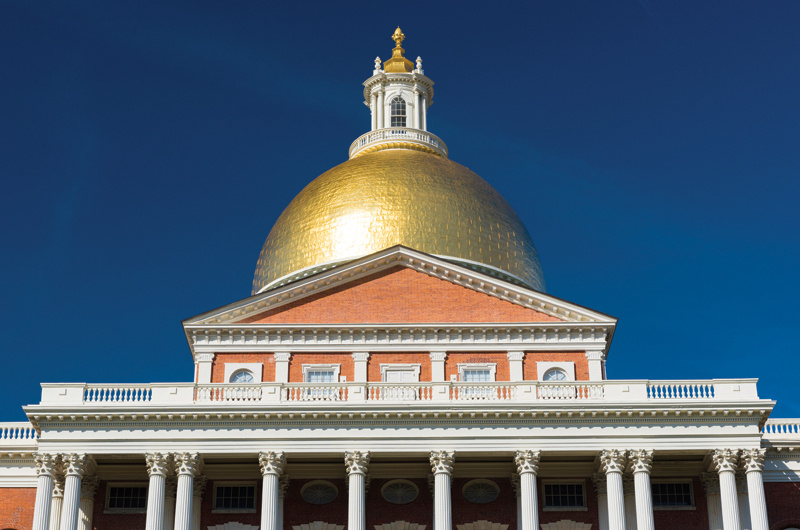 “This legislation sends a message to the nation and the rest of the world that a handful of climate deniers in Washington, D.C., do not speak for the people of Massachusetts,” he said in a statement after the bill’s passage by a vote of 145–10. The bill moved to the Senate, where the primary sponsor is Cyr. 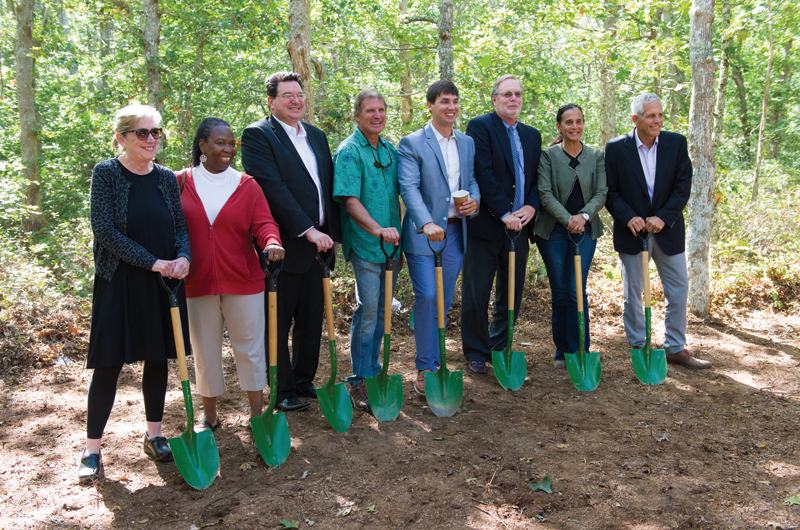 Shovel Circuit: Fernandes attended the groundbreaking ceremony for Scott’s Grove, an affordable housing project underway in West Tisbury. It was an ironic turn of events in at least one way: Attorney General Healey specifically mentioned Fernandes’s skill with social media as being a factor in her election victory coming down the stretch. When I brought the Facebook scandal up with him last April, he bristled slightly. “What it really comes down to is that I was a teenager at some point,” said Fernandes. He was tired of the narrative. But he found his stride in emphasizing that we are now seeing the first generation of politicians who grew up in a digital age and whose transgressions will live on in virtual eternity. Perhaps because he is among the youngest members of the legislature, as is Cyr for that matter, Fernandes often looks at issues from the perspective of a rising generation. This is especially true of his special passion for environmental issues. “As a millennial, there is no issue that will have a greater impact on my generation and my children’s generation than climate change,” he said after the passage of his Paris Agreement bill in the House, echoing similar comments he has made elsewhere. The ease with which he has transitioned from helping to fight the same political battles he did at the at the statewide level to the seemingly smaller stage of the district is no surprise to his old boss. “The times when Dylan was happiest on our campaign were always when we got back to the Cape and Islands or got to talk about issues that matter to residents of his district,” Attorney General Healey wrote. When Fernandes himself speaks of the geographical specificity of his job, it’s with a sense of comfort. “I am exclusively focused on the district. I love this job. I wake up every day and serve the district I love most. It’s an incredible honor,” he said. But he’s the first to admit that public office was not something that he would have predicted, “This wasn’t my dream career, but I see a lot of challenges and I want to get things done,” he said. And he plans to keep going. “If I’m lucky enough to keep getting elected I’d like to serve for three or four more terms.” What lies beyond that, he won’t say. Dream career or not, for now, Fernandes seems like the political version of a kid in a candy shop. “I learn something new every single day and constituency work is the most rewarding,” he said as he headed for the afternoon boat back to Falmouth. I am just plain proud to have campaigned for Dylan Fernandes, so clearly the right person for this job. Great article. Thanks.